Named for the Chinese story and the color of the cliffs. 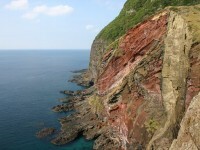 The western side where Red Cliff is stretches about 1 km, followed by brightly colored cliffs of red, yellow, brown, and purple--a scenery which can be enjoyed from the sea as well. The sight of the red cliffs reflected against the azure sea in the setting sun is a sight that would inspire anyone to awe.